Ha! Love it. I have a jar in my fridge as we speak, and visitors usually have to bring some over for me. A cheese sandwich just isn’t a sandwich without it. Now how about that marmite…. Ask your husband for a rendition of the dreadful tv adverts which ended with families chorusing “bring out the Branston” together. That’s enough to restore you to your former sceptical condition. god help me, i actually put rocket on things these days. haha, you definitely deserve British citizenship for eating that. I’m Danish and normally not a big fan of pickles (or Marmite or brown sauces) but then I saw myself running like a drug addict to the corner shop to buy a jar of Branston a couple of months ago. ps. thanks for a great blog, I’m glad that you’re back. No, it’s wrong, all wrong, I tell you! Mind you, I used to say that about Marmite, and yet I find myself eating the stuff these days. Funny how tastes can change. if you start loving marmite i may come over there myself and revoke your US passport. 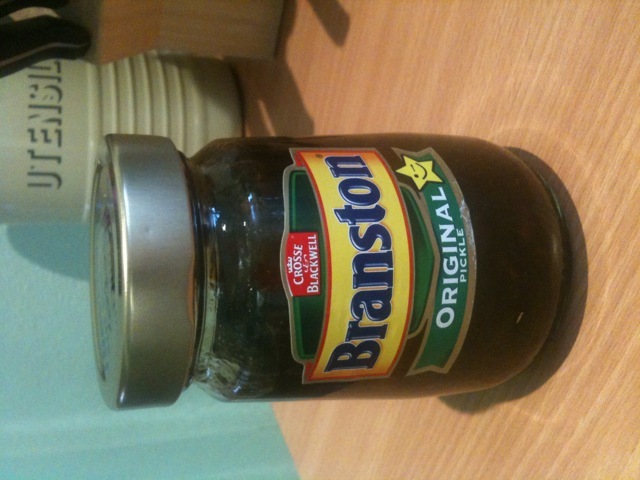 to be fair, i’ve never tried branston’s concoction but given that it has to do with pickles i’m not all that surprised that you finally gave in. Well.. well done for trying it!! And then for admitting you like it! YAY! We love pickle. Esp the homemade stuff. 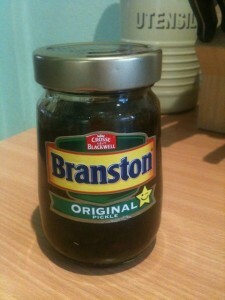 I love Branston Pickle!!!! Nowadays, a “ploughman’s” from M&S or Waitrose is my idea of a treat….yeah i know….very sad. If you really want to morph as ‘British’, you need to like Bovril too. Which a friend of mine summarised as ‘boiled down bovine bones’. The Branston is only the beginning, i fear? Oh, honey. Really? Pickle? I’m so sorry, nobody should ever have to endure such a tragedy. I know that what actually happened is that someone sprinkled it with crack cocaine, spread it on your cheese sandwich when you weren’t looking and therefore you are now tragically addicted. Don’t worry, one day you will beat the habit.